Like all of the great foodways of the world, modern-day barbecue is riddled in history and culture. While the Spanish introduced the term barbacoa to Europe after discovering the technique during Columbian exploration in the Caribbean, the method of cooking meat over fire or indirect heat is as old as cavemen. Barbacoa, which ended up being synonymous with traditional Mexican barbecue, derived itself from the term barabicu which the Taino people of the Carribean used prior to Spanish conquest of the New World — or so one story says. Many other folktales exist about the history of the term barbecue. According to one tale, French visitors of the Caribbean described the process of cooking a whole pig as barbe à queue, which translates to “from beard to tail.” I might start using that terminology instead of the trendy “nose-to-tail” method of cooking! Regardless of stories passed down through generations, barbecue is undoubtedly one of the most popular cooking methods in the United States, varying from region to region with the people who cook it. Americans may not have lit the first open cooking flames in history, but we have managed to transform a simple cooking method into a worldwide phenomenon. Sometimes spelled barbeque or simply BBQ, good barbecue can be found from sea to shining sea. It is important to note that barbecue and grilling are not the same. Barbecue is a method of using indirect heat to cook “low and slow,” whereas grilling uses direct heat to quickly cook over higher temperatures. Also, not all American barbecue is created equal. Perhaps the regional distinctions are most prominent in the South, and it is in the South where seemingly the most heated debates about all things barbecue take place. Each state and culture has perfected its own style. From cuts of meat to secret ingredients in sauces and rubs to the wood that is used to provide smoke flavor, it’s the attention to every detail that has earned the South its reputation for famous barbecue. One southern state with an extreme pride in their version of barbecue is North Carolina. While sauces vary slightly some from east to west throughout the state, the meat of choice is pretty much always pig shoulder cooked in the style of pulled pork. 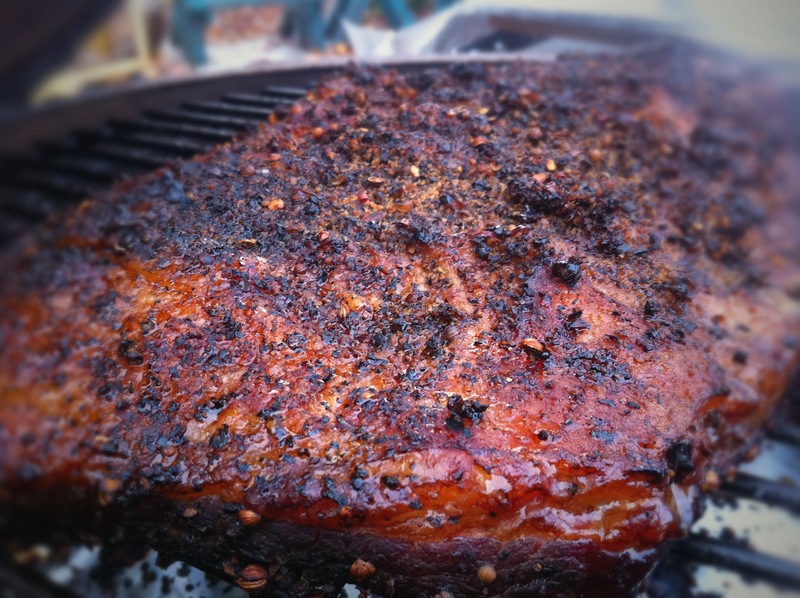 In fact, the term barbecue pretty much means pulled pork in North Carolina. Sauces are vinegar-based and are a compliment to the finely chopped pork. In this area, sugar is saved for dessert. In South Carolina barbecue, mustard matters most. Like other regions of the Carolinas, pork is the prominent meat used, but South Carolina’s golden touch is unique. It contains the same ingredients found in most sauce recipes such as vinegar, sugar, and spices, but uses mustard to set itself apart. Jumping over to the Lone Star State, Texas is known for having a completely different meaning of barbecue. There are countless barbecue joints across the country that claim to have “traditional Texas barbecue,” but if you want the real thing you may have to wait a while. Texas-style barbecue is known for using brisket, which is a tougher cut of beef that requires being cooked for a long period of time. Most pit masters will smoke their briskets for twelve hours or more, resulting in a melt-in-your-mouth tender slice of deliciousness. The methods of flavoring vary some across the state and involve both dry rubs and sauces. It’s difficult to narrow down Texas barbecue to one particular style, but commonly the meat is covered in a dry rub before being cooked. It is more spicy than sweet, consisting of black pepper, chili powder, garlic powder and various other spices, depending on the chef. Texas sauce is usually added as a finishing sauce or served on the side. The sauce has a tomato flavor, but is also sweet with ingredients like molasses. Consistencies vary, but many traditional Texas style sauces contain meat trimmings that give it an authentic taste. Texas barbecue also uses many different types of wood for smoking across the state but the central Texas barbecue trail around Austin is known for their mesquite smoke. 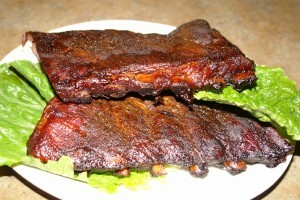 In Tennessee, ribs are the main ingredients, though there are plenty of barbecue establishments that will argue about whether or not they should be served “wet” or “dry.” It seems that most Tennessee barbecue recipes require a pretty generous amount of sauce to be placed on the ribs before serving, thus making them wet. A lot of famous Memphis barbecue joints will serve ribs dry to show off the rub that the chef has created and give you a portion of their signature sauces on the side. As is true in most places, the spiciness of the sauce varies, but it is usually tomato- and vinegar-based with some tang and a hint of sweetness. 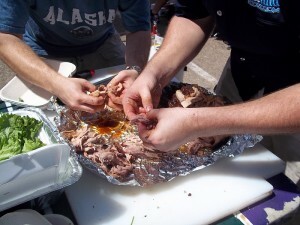 Each May, Memphis hosts one of the largest barbeque competitions and festivals on earth. You can rest assured that you’ll eat some pretty amazing ribs! The inspiration behind the touch of sweetness that is popular in many barbecue styles today comes from perhaps the most famous style of barbecue, Kansas City. 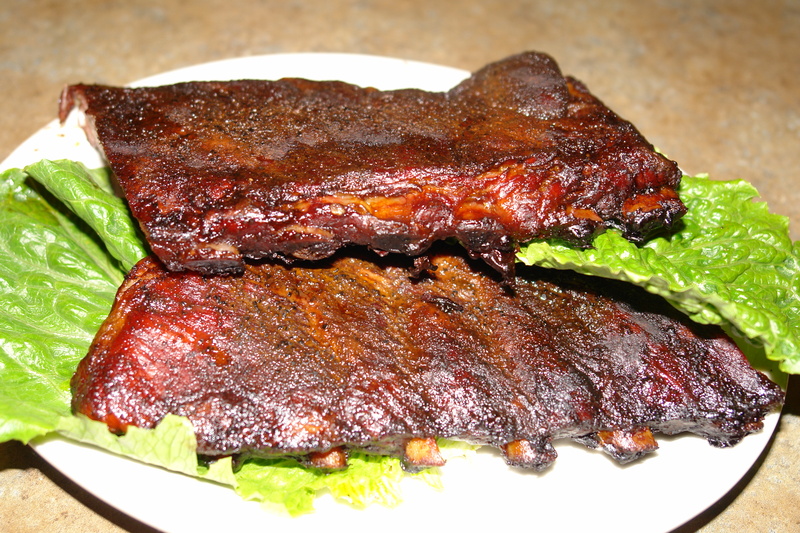 Missouri is known for their St. Louis cut on pork spare ribs and for their KC-style barbeque sauce. The focus for Kansas City is on the sauce rather than the type of meat. Being in the Midwest, the state had access to various types of butchered proteins for many years, and as a result, has utilized its resources and become a go-to source for all types of meats. 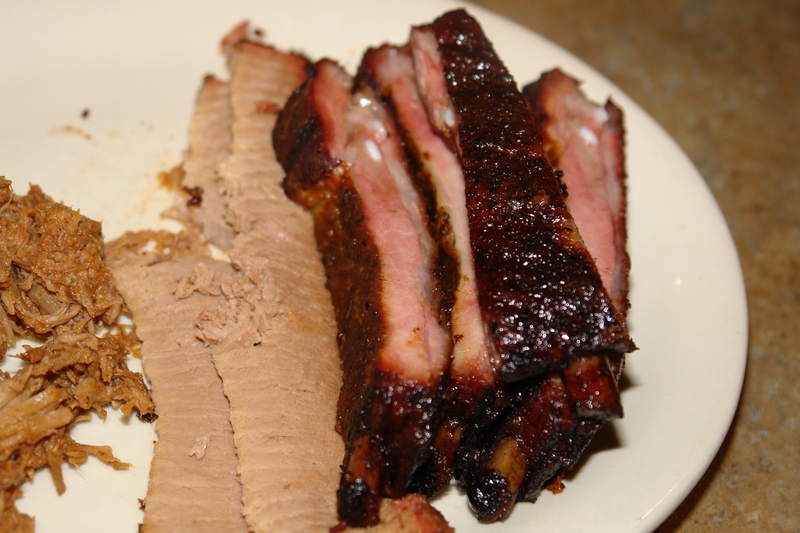 The source of sweetness of most Kansas City style barbecue is either molasses or brown sugar. Like most sauces, it contains vinegar or tomato to balance the taste. A traditional KC-style sauce will be much thicker than a Memphis or especially North Carolina sauce. The sugary sauce adds a final layer to any type of meat without being too wet or too dry. Be on the lookout for imposters, though. Many store-bought “Kansas City” style barbecue sauces are sweetened with high-fructose corn syrup and lack the authenticity of the original sweeteners and seasonings. Alabama brings something unique to the table with its white barbecue sauce. The base of the sauce is mayonnaise and most commonly contains vinegar and a sweetener. The sauce can be added to chicken right before it’s finished cooking, but Alabamians put it on almost everything from French fries to bread. Kentucky also has something special to offer the barbecue world: bourbon! It turns out that the corn-based whiskey is a great flavor additive to a sauce or glaze when working with smoked meats. Although Louisiana is not known as the epicenter for all things barbecue, the state still possesses its own flavor and style when it comes to one of America’s favorite pastimes. One common misconception about Louisiana cuisine in general is that everything is covered in hot sauce, but there is much more that goes into some of the world’s most flavorful and unique foods. Louisiana’s cuisine is famous for being a collaboration of several cultures including Caribbean (the origins of barabicu), Italian, German, African, Native American, French, and many more. Rather than having one specific style of barbecue, the technique varies from household to household. One of Louisiana’s most famous forms of slow cooking is a cochon de lait, which translates to “pig in milk.” Every year the state hosts its famous Cochon de Lait festival in Mansura. The main star of a cochon de lait is a young suckling pig usually weighing anywhere from 25 to 100 pounds. Once the pig is butchered, it is cooked one of two ways. The first method involves a cooking shed in which the pig is hung on a rotisserie and cooked in front of an open fire. The second uses an invention called a “Cajun Microwave,” which is essentially a roasting box in which the pig sits underneath a hotplate of charcoal, essentially creating a large outdoor oven. 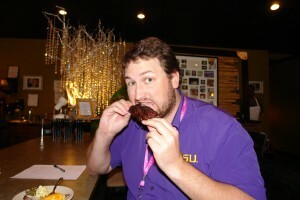 Both methods are unique to Louisiana and vary depending on the chef’s preference or the family’s history. Either way, a cochon de lait is bound to be a good time. There are many other regional varieties of American barbecue. One of the best parts about barbecue is that it is both a noun and verb. A barbecue is also a party where people can get together, enjoy some adult beverages, and bond over outdoor cooking. Wherever you are and whichever style of barbecue is your favorite, just make sure to add family or friends, and enjoy life. Good barbecue may take a while to cook, which is just all the more reason for you to slow down and enjoy it!